Pad contains 50 perforated full-white, non-bleed sheets in large A1 size for easels. Holes punched to fit standard flipchart easels. Individually housed in protective polybag for easy storage and transportation. 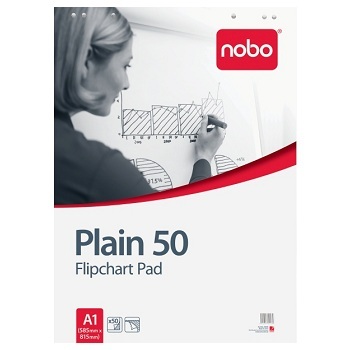 Premium, white paper without adhesive allows for easy flip chart presentations. Each sheet is made using specially coated recycled paper to resist markers bleeding through to the next page. Each pad features a sturdy back card, handy carry handle and universal slots for mounting anywhere. Size - 635 x 762 mm sheets. Plain White. Lightweight and perfect for everyday presentations and brainstorming. This economy flipchart pad is Australian made. Size - 550 x 810 mm. Plain 55 gsm White paper. Large in size, yet easily portable. Use with Post-it Notes to bring your big ideas to life. Big pads help you visualize your ideas and display on smooth, vertical surfaces. Vibrant coloured original self-stick, repositionable, touch down adhesive notes. Individual 30 sheet pad. Available in a choice of sizes. BEST SELLER. If you have a good idea make it stick! Each pad features a sturdy backcard, handy carry handle and universal slots for mounting anywhere. Adhesive-backed sheets stick, without damage, to most wall surfaces. No tape. No tacks. No bleed-through. You'll love the convenience! 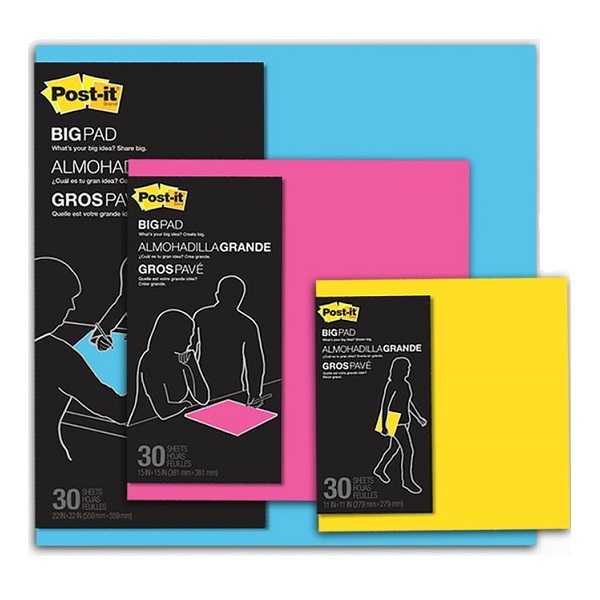 Keep your notes straight on this Yellow, lined Post-it® Self-Stick Easel Pad. Size - 635 x 762 mm sheets. Yellow with Feint Blue lines. Put your Green Office policy into action! Made from 30% post consumer waste. Post-it Self-Stick Wall Pads turn any room into a meeting room! Self-stick sheets feature premium, bright white paper that resists marker bleed-through. Sheets stick to most surfaces and can be repositioned again and again, without surface damage. Size - 508 x 584 mm sheets. Plain White. Pack of 2 Wall Pads (20 sheets per pad) with Command™ Adhesive strips. Portable and convenient, the Post-it Tabletop Easel Pad is great for meetings on the go! Sheets stick on virtually any surface and remove easily without damage. Post-it® Easel Pad Wall Hanger turns walls into meeting space. Mounts to most walls and doors with Command™ Adhesive strips. Sleek, lightweight hanger holds and stores two full-size Post-it Easel pads or 3M Flip Chart pads for presenting or storage. Hanger is repositionable for portability. Each Wall Hanger comes with 4 Command™ Adhesive strips. Tired of using butcher paper in meetings? Avery® Cling Sheets are the professional solution. The easel sheets cling to the walls with static, like a portable whiteboard, to allow you make your point without damaging the wall or window. Reusable with whiteboard markers. Reposition again and again. Size - 667 x 864 mm. Portable: roll it up and go. Individual roll of 35 micro perforated sheets. Plain White.